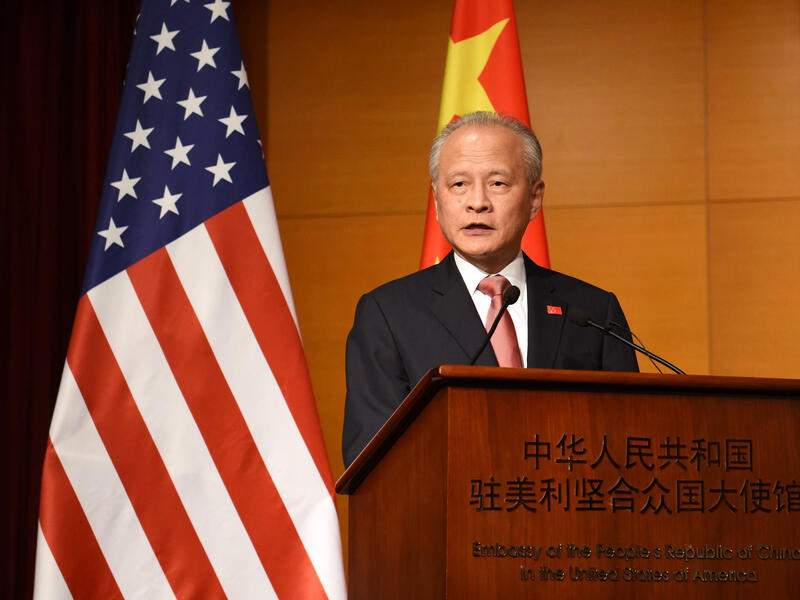 Cui Tiankai, China's ambassador to the U.S., speaks during a reception at the Chinese Embassy in Washington, D.C., in July. Amid rising tension, the veteran Chinese diplomat sat for a wide-ranging interview at NPR headquarters Wednesday. He offered a window into some of the frustrations of the world's most important international relationship, as a dominant power spars against an increasingly powerful one. The fight pits China's deeply entrenched leader Xi Jinping against the unpredictable President Trump. Cui, elegantly dressed and silver-haired, asserted that the trade war could be resolved through "good faith." "We are ready to make some compromise," he said, but in recent negotiations "the U.S. position keeps changing all the time, so we don't know exactly what the U.S. would want as priorities." The Chinese government, he said, is willing to take steps to reduce the U.S. trade deficit with China, which is a central complaint of President Trump. He asserted that China is also willing to commit to "reforms" to China's economy, where state-supported firms often compete for business with built-in advantages against foreign competitors. The U.S., he said, must clarify what it wants. "More than once" in recent months, the ambassador said, "we had some tentative agreement between the two working teams, then just overnight, the tentative agreement was rejected, and the demand from the U.S. changed. So this is very confusing." White House officials have not described China as so accommodating. In an interview last month on NPR, presidential trade adviser Peter Navarro insisted that ending the trade war "is all up to China," and that "if China stops their unfair trade practices, it's over." Navarro said China "basically cheat[s] us," and he repeated demands that have been made, with little success, by administrations from both parties, such as better protection of intellectual property rights in China. The U.S. especially wants China to allow American firms to do business there without being forced to share technology. Ambassador Cui said he, like other diplomats, has tried every means to better understand Trump. Deeming U.S. policy statements inconsistent ("If people tell you one story one day and a different story a different day, then you're confused"), he has turned to the president's Twitter feed. "If it's written by the president, it has to be meaningful," Cui said. China's chief diplomat also obtained the Bob Woodward book Fear, which chronicled chaos and dysfunction in the White House. "I certainly have a copy," he said. "I have talked to many other ambassadors here. We all share the same concern. All of us want to have a better understanding of what is happening here, and what it would mean for us." Cui urged the White House not to follow up on a reported idea to bar Chinese students from American universities, which he called "very dangerous," saying that "people-to-people contacts" offer a "foundation of friendship." But he demurred when asked if China would allow more openness: welcoming more journalists or scholars to sensitive areas of his country, such as the Xinjiang region, home to majority-Muslim Uighurs, and traditionally Buddhist Tibet. Xinjiang, he insisted, faces a threat of "terrorism," while journalists must stay away from Tibet because of its "very high altitude." China's ambassador believes the United States needs to make up its mind. Cui Tiankai says the United States doesn't seem to know what it wants on trade in the middle of this escalating conflict. Cui is China's man in Washington, this elegantly dressed, diplomatic veteran, and he sat down with Steve Inskeep for a rare interview. STEVE INSKEEP, BYLINE: What is preventing an end to the trade war with the United States? CUI TIANKAI: We certainly don't want to have a trade war with the United States or with any other country. CUI: Yeah. This is very unfortunate. But we want to solve it. We do need goodwill and good faith from both sides. INSKEEP: Are you seeing goodwill or good faith from the United States? CUI: Well, tell you the truth, not sufficiently. INSKEEP: What is the evidence of that? CUI: Well, for instance, the U.S. position keeps changing all the time so we don't know exactly what the U.S. would want as priorities. We are ready to make a deal. We are ready to make some compromise, but it needs the goodwill from both sides. INSKEEP: Ambassador, you used the word priorities. I'm reminded that a few months ago, the U.S. Treasury Secretary Steven Mnuchin went to China for some negotiations, and it was said that the United States made a very wide range of demands that were rejected out of hand by China. Is that what you mean by priorities, that you want the United States to pick a few items rather than demanding every complaint be fixed at once? CUI: Well, actually, in the last few months there have been contacts between the two governments. And we offered to reduce the trade deficit of the United States, for instance. And we also present a very good proposal to the U.S. side about the further reform and opening up in China. I think more than once we had some tentative agreement between the two working teams. Then just overnight, the tentative agreement was rejected and the demand from U.S. changed. So this is very confusing. INSKEEP: That, perhaps, leads to another question. What is your method for trying to determine what the president of the United States thinks? CUI: Well, we'll have to look at the policy statements. We have to look at what the U.S. team will tell us on the negotiating table. But I think that we still need more good faith. If people tell you one story one day and another story, a very different story, another day, then you are confused. INSKEEP: Do you follow the president's Twitter feed? CUI: ...So we are just doing the same. INSKEEP: But do you find meaningful information there? Some of his political allies will say, disregard that, his actual policies are something else. CUI: Honestly, I think if it's written by the president, it has to be meaningful. INSKEEP: There was a news story here suggesting that foreign embassies and consulates were buying large numbers of copies of a Bob Woodward book about the inner workings of the White House. Is the Chinese embassy filled with copies of Bob Woodward's book? CUI: Naturally, people would like to get a copy and see what happens, what is written in the book. INSKEEP: Is that a yes? You have lots of copies of "Fear" around the Chinese embassy? CUI: It's really up to the individuals whether they want to buy it or not. I certainly have a copy. So I have talked to many other ambassadors here. We all share the same concern. All of us want to have a better understanding of what is happening here and what it would mean for us. INSKEEP: Do you feel you understand the president at this point? CUI: Well, I hope that we could have a better understanding. INSKEEP: What have you thought about as there have been news reports that the administration has considered proposals to ban Chinese students from studying at American universities? INSKEEP: Indiana. Indianapolis, where I'm from. CUI: Yeah. There's a children's museum. INSKEEP: Sure. It's a great one. CUI: It's a great one. And a few years ago, the museum hosted a big, big event on Chinese culture, and I was invited to address the opening ceremony. And I had a meeting with then-Governor Mike Pence. Governor Pence was a great supporter to such people-to-people, intercultural exchanges. So why should we cut off all these ties, all the natural ties between our two peoples? INSKEEP: Would you encourage greater openness going the other way? If American scholars who may have controversial opinions want to visit China, if American journalists want to go to sensitive areas, like Tibet, would you encourage greater openness on China's part? INSKEEP: I think American journalists and scholars could handle the altitude. I mean, we have high altitudes in the United States. CUI: Well, not everybody could quickly get used to such climate and natural conditions. Even for Chinese, many of them would not feel very well once they are there. INSKEEP: What about Uighur areas in far northwest China? CUI: Well, this is part of China. So the whole country is open to the rest of the world. Certainly, this part is also open. But, honestly, in this part of China, we have a particular problem that is terrorism. There are violent extremist groups. I'm sure some people, or there's some attempt to create a situation like the ISIS in that part of China. INSKEEP: What have you thought about as the United Nations has said that hundreds of thousands of people in Uighur areas have been put into camps? CUI: You see, very often, widespread stories may not be the true stories. I think whatever we are doing in that part of China is for the well-being and safety and security of the people there. INSKEEP: Are you putting people in camps to do that? CUI: It's not - you see, first of all, we have to take a measure to make sure that groups like ISIS will not be spreading in that part of China. Secondly, we have to make sure that people have a means to build a better life. For instance, they have to learn more skills. They have to learn techniques to develop themselves. And also we have to maintain local stability. CUI: No. I'm not saying there are camps. INSKEEP: Are you saying there are not? CUI: I'm not saying there are camps. I think that there are efforts to help people to learn skills, techniques, to build up their economic capability and so on. INSKEEP: Ambassador, thank you for coming by. GREENE: Cui Tiankai is Chinese ambassador to the U.S. Steve also asked him about North Korea and China's global ambitions, and we have a transcript at npr.org. Transcript provided by NPR, Copyright NPR.